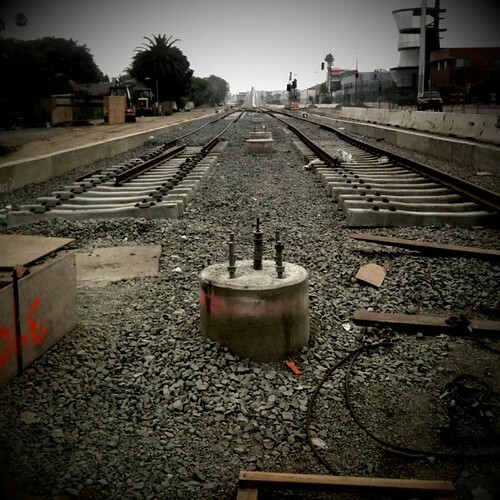 Newest Track on the Expo Line, originally uploaded by Nigel Stewart. I was rolling around on my bike this morning and I found myself in Culver City where Phase 2 the new Expo rail line is under construction. Remarkably there was an opening in the fence along Rodeo Blvd. and I was able to snap some pics of the new track being laid down. Click above to be taken to my Flickr page where you'll see a link to the set along the page's right margin. As a resident of Santa Monica I am so excited to see this project come to life. Ever since moving to Los Angeles in 1994 I have been a strong advocate for more public transportation, especially rail. In 2015 I will be able to hop on my bike to 4th and Colorado (1 mile north of where we live) and be on a train bound for downtown Los Angeles and its connected outlying cities like Pasadena, Burbank, and Long Beach. This page contains a single entry by Nigel published on September 12, 2010 5:31 PM. iPhone 3GS Vid from July 2010 Italy Trip was the previous entry in this blog. Nigel's Autumn Equinox 2010 MIx is the next entry in this blog.